Kona Judiciary Complex | | Nan, Inc. In late October 2016, Nan, Inc. broke ground on the $80 million Kona Judiciary Complex. Located on a ten acre site in Keahuolu, North Kona, the 140,000 square foot facility will eventually put all Kona court services in one place. Currently, proceedings take place at three different locations in Kona and none of them were originally built to be courtrooms. In fact, one courthouse is in the old Kona Hospital. 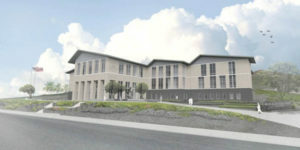 The three-story facility now under construction will include five courtrooms, a law library, self-help center, conference rooms, holding cells, witness rooms, attorney interview rooms, and a grand jury meeting room. The design includes space for future expansion or courtroom additions. Plans also provide 290 parking stalls for public and employee vehicles. Plans also call for state-of-the-art security and electronic equipment. The facility will be energy efficient and environmentally friendly. The new complex is slated to be finished in 2019. Nan, Inc. is proud to play a role in building the future of West Hawaii.